FIANNA FÁIL HAS moved to distance itself from the row over water charges created by the release of cabinet papers detailing the previous government’s work on setting up a ‘water agency’. 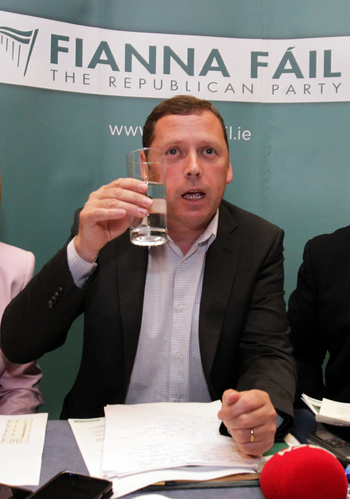 In a statement to TheJournal.ie the opposition party’s environment spokesman Barry Cowen has said that the “mess” surrounding Irish Water is “solely the responsibility of the government”. The cabinet papers were released last week to RTE’s The Week In Politics. In detailing how the previous Fianna Fáil government planned to implement water charges they serve as a “reminder” of the kind of bills the public can expect to eventually pay according to the Anti Austerity Alliance. The previous government had estimated that any water charges incurred would lead to estimated bills of €500 per household per year, and that the installation of water meters alone would cost €500 million over five years. “It’s no secret that water charges were being considered at the peak of the global crisis as part of the response to alleviating Ireland’s debt at that time. The €500 charge per household was an estimate worked out by the Department of Finance based on recovering the full operating costs,” Cowen said. "At no stage was it agreed to charge €500 per household nor were any charges brought forward in the previous government’s budgets. Any attempt to suggest otherwise is deeply disingenuous." "The previous government implemented 70% of the budget adjustment that was needed so that Ireland could recover as quickly as possible. It did so without introducing water charges." "The current government then went on to complete the budget adjustment process, again without introducing water charges." “Irish Water was established because it was Fine Gael policy. The mess that has emerged is solely the responsibility of this government,” he added. Ruth Coppinger, Anti Austerity Alliance TD for Dublin West, says that the information released “shows that Fine Gael and Labour are clearly implementing the same plan which was drawn up by Fianna Fáil and the Greens”. “The main point to this is that it’s a reminder to the public about where water charges are ultimately heading,” she said. "They are seeking to eventually get to a situation of full cost recovery through domestic water charges which will mean bills of €500 per household. We have consistently made the argument that concessions like the cap, the so-called conservation grant, and other ideas which they had like the free water allowance which they scrapped were only temporary that their ultimate goal was full cost recovery." After strenuous objection from the public at the scale of mooted bills, water charges were capped at a relatively low level by the government until at least 2018. The current flat rates stand at €160 per year for a single adult household and €240 annually for a multi-adult dwelling. RTE’s cabinet papers reveal that former Green party leader and Minister for the Environment John Gormley was opposed to capping charges as it offered “no incentive for consumers to conserve water”. The documents similarly reveal how far advanced the previous government were with plans to introduce water charges by September 2010, two months prior to the arrival of the Troika. “The release of this information should make for a reminder for the public and water charges movement of the necessity to maintain and build the massive boycott which has been built over the last few months,” said Coppinger.